I love this shirt. Midland is my favorite group, I am proud to promote them! Great shirt, unisex size, nice soft material, not stiff. I purchased a large as I wanted it looser fit to French tuck. For reference my measurements are 37-30-39. Love this band! The shirt looks great, really like it. Nothing bad to say. Fit great too. Excellent quality, the shirt washes well and the cotton is soft. 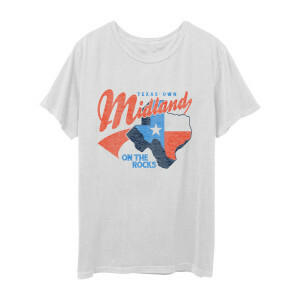 Texas proud...glad this understated design is out there. Loved the shirt &amp; the fabric, just needed a large if ever available...Love Midland! Great shirt.Fits great.shipping was spot on time.I will order more. Very soft normal fit shirt. Ain't too tight so it fits them bigger beer bellies!